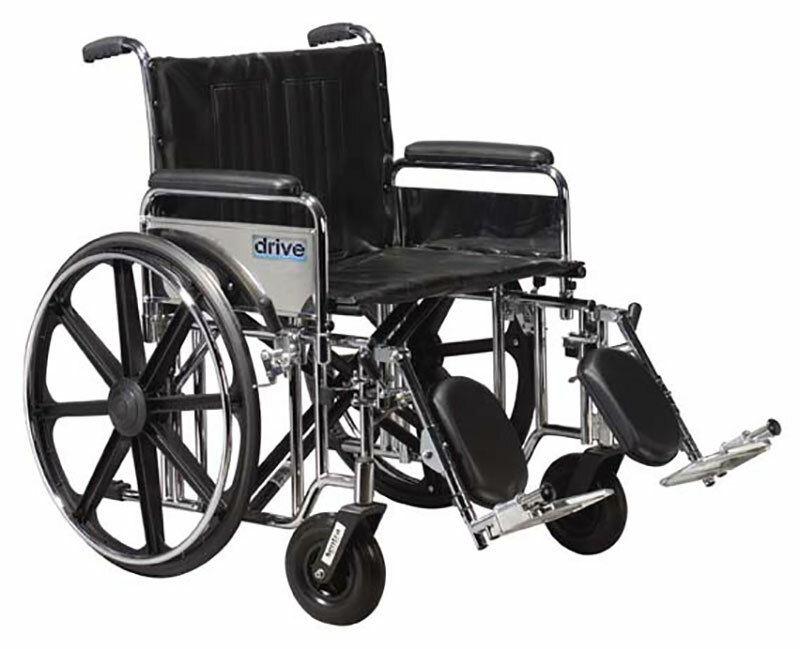 Drive Medical 20" Sentra EC Heavy-Duty Wheelchair - STD20ECDFAHDSF. The Bariatric Sentra EC Heavy Duty Wheelchair with Detachable Full Arms and Swing Away Footrests by Drive Medical comes with a "Dual Cross Bar" that reinforces the carbon steel frame, making this chair capable of a 450 lbs. The Bariatric Sentra EC Heavy Duty Wheelchair with Detachable Full Arms and Swing Away Footrests by Drive Medical comes with a "Dual Cross Bar" that reinforces the carbon steel frame, making this chair capable of a 450 lbs. weight capacity. The carbon steel frame has an attractive, chip proof, maintanable, triple coated, chrome finish and double embossed, vinyl upholstery, making this bariatric wheelchair durable, lightweight, attracive and easy to clean. The standard, dual axle, conveniently provides an easy transition of seat to hemi-level. Comes standard with detachable full arms, swing away footrests, 8" front caster wheels, urethane tires, aluminum footplates, chrome handrims, and push to lock wheel locks, ensuring user safety. 3 year warranty.